This heavy duty nozzle will be the last one you ever buy! I don’t know about you, but I’ve gone through a lot of hose nozzles over the years. I can’t tell you how many of those plastic nozzles have passed through my garage on their way to the trash! I ran over a couple and a few I just dropped and that was the end of them. They’re cheap enough to replace but, over the long run, I think I lost a lot of money by not investing in a quality nozzle. A few years ago, I found a version of this Fire Hose Nozzle and I haven’t purchased a plastic nozzle since. I recently upgraded to this particular nozzle because the construction is just so impressive. This Fire Hose Nozzle is made out of stainless steel encased in thick rubber. I’ve dropped it, I’ve drug it across my driveway, and it still performs like new. The threaded brass insert (where the hose goes) has a rubber gasket to prevent leaking. 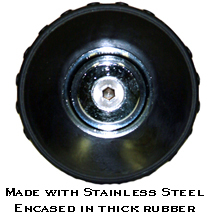 The outer rubber rings absorb impact and they also protect your vehicle if you accidentally hit the paint. First, this nozzle provides enough water pressure to blast grime off your vehicle. 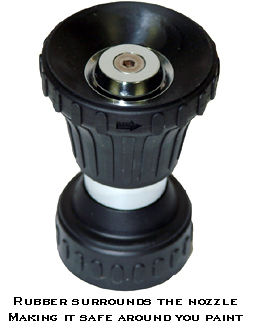 If you own an SUV or jeep with those highly visible wheel wells, you’ll love how this nozzle blasts the mud and muck out of there. Remove stubborn grime from body panels without scrubbing or scraping. 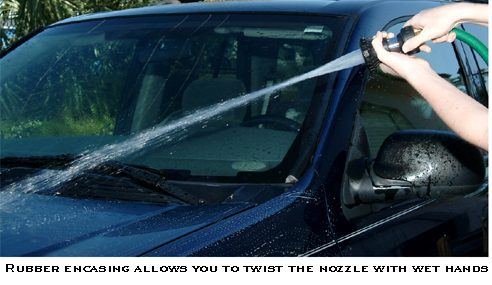 The Fire Hose Nozzle is like having your own touch-free car wash at home! Secondly, the Fire Hose Nozzle has a range of 40 feet. If you’re not too fond of getting wet while you wash your vehicle, take a few steps back. You can rinse your vehicle at a safe distance with this nozzle and it will still have enough water pressure to do an effective job. Also rinse off vinyl siding, RVs, vans, and second story windows without a ladder. Thirdly, you can adjust the spray from a strong jet to a gentle fan spray and everything in between. Just turning the nozzle gives you several spray options. I like to use the jet for mud and bird droppings. Then I switch to a more natural flow for general rinsing. I use the fan spray on the flower beds but you can also use it to duplicate the “spot-free rinse” you get at the car wash. The molded rubber encasing ensures you can twist the nozzle with wet hands. The Fire Hose Nozzle fits onto any standard garden hose. I recommend using a thicker hose so you can get the most water pressure. When you’re finished rinsing, don’t forget to dry your vehicle with the Cobra Supreme Guzzler Waffle Weave Microfiber Towel. This super absorbent weave is paint-safe and very soft. Drying after each wash is a big step towards preventing water spots and mineral deposits. If you’re looking for a hose nozzle that will last, this is it. The Fire Hose Nozzle’s sturdy construction will give you years of trouble-free performance. It may be the last nozzle you ever buy! This is the best Water Hose Nozzle I've ever used!!! Of all the Water Hose Nozzles I've ever used this is the best one of them all. The quality of the rubber and how strong the water sprays is amazing. I've never gotten excited over a Water Hose Nozzle until I tried this one. I like the fact that if you accidentally hit your car with it you won't scratch the paint or dent your car. I'm a fussy pain in the neck about using really good quality products especially on my car and this is one of them. ProsGreat quality & powerful water flow. The rubber protects the vehicle from scratching and provides protection for nozzle should you drop nozzle on cement surface. ConsHave to twist completely to turn off water. Had to but a shut off adapter. I appreciate the ease with which it is possible to change from strong stream to more gentle fan. It is well constructed. ConsA tad bulky. Not a serious problem.